The years after high school can be incredibly challenging, whether one is attending college, a vocational training program, or going into the work force. These are usually years when one’s identity is in transition, faith is challenged, and new habits are formed. These years can be incredibly crucial when it comes to maintaining and growing personal faith and a relationship to a church, which is why Impact invests so heavily in our college-age young adults, especially those who have grown up in our youth program. We have a Sunday morning Bible class especially for them, taught by Paul Woodward, one of our elders, which has been lively and wellat tended. We also have a small group meeting on Sunday nights at the home of Dennis Jaeger, our Youth and Children’s Director. The origin of this small group is especially encouraging; it was begun at the request of two of our college students, Ramiro Benavides and Vicky Hernandez, out of a desire to grow closer to God and to their peers. Our goal, and theirs, is for that group to continue to be as student-led as possible, with Ramiro and Vicky being responsible for inviting and communicating with others, organizing meals, etc. The Brooks Scholarship Fund continues to be a valuable resource for 16 of our college students, who attend 9 different universities or community colleges, from Spellman in Atlanta all the way out to Texas Tech in Lubbock. The majority of these grew up at Impact and in most cases are the first from their extended families to attend college. These students benefit greatly not only from the financial assistance but also the added accountability and encouragement that goes with it from Paul Woodward, who oversees the program. Another effort we are excited about is a Tuesday lunch group on the University of Houston campus with the five or six young Impact members who attend there. The group is led by Patrick Lemmons, one of our ministers, and his wife Tyler, who is Impact’s Mentoring Director. So far the group has been a success and we are hoping it will be a tool for further outreach on the UH campus. We also look forward to future cooperation and the opportunity to support The Point, the excellent campus ministry sponsored by the Houston-area Churches of Christ. One young woman who attends the UH group who we are very proud of, and is a particularly good example of the breadth of our college-age ministry is Ruth Villasenor. 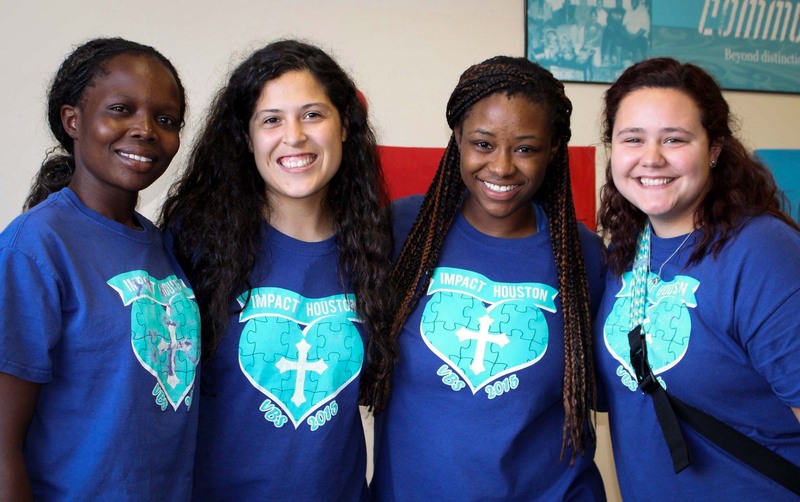 Ruth grew up attending Impact’s youth programs from childhood and is now majoring in nursing at UH with significant help from Impact’s scholarship program. Ruth also has the spiritual community she needs to continue to flourish, in the form of a ride to Sunday Bible class and worship, the group that meets on campus on Tuesdays for lunch, and a mentor in Tyler who helps lead that group. Ruth also takes advantage of another opportunity given to her – the space to serve and give back. She is currently helping Tyler with her middle school girls’ Bible class on Tuesday nights. As you can see, it takes a team of people to minister to Impact’s college-age young adults, and you are also a part of that team! We simply could not continue to serve them in these many ways without your ongoing help. Thank you for your partnership, and may God continue to guide and lead these young adults through all stages of their lives.